Many of take for granted, the use and mechanics behind the Frank’s Box or ghost box. The creator was Frank Sumption who died not long ago. He first devised the unique contraption to help collect EVP’s (electronic voice phenomenon). Mr. Sumption began with a background in Ham radio and electronics. With his knowledge he was able to modify a radio to allow the user to hear paranormal voices and sounds. Mr. Sumption’s work continued for many years. He created several versions of his device. As the news spread, the demand for the new machines grew. Currently there are just under 100 original boxes in existence, but we now use the more modernized ghost boxes. EVP or electronic voice phenomena was discovered in the late 1950s and has become well known today thanks to numerous TV shows featuring ghost investigators using audio recorders to capture the voices of ghosts and spirits. More ghost hunters are embracing the two-way communication device called a ghost box (aka the Frank’s Box). Following on the heels of the Spiricom, one of the first known, two-way communication devices used to bridge the gap between the earth realm and the spirit realm, the Frank’s Box was the first device that allowed ghost investigators to speak to the dead. 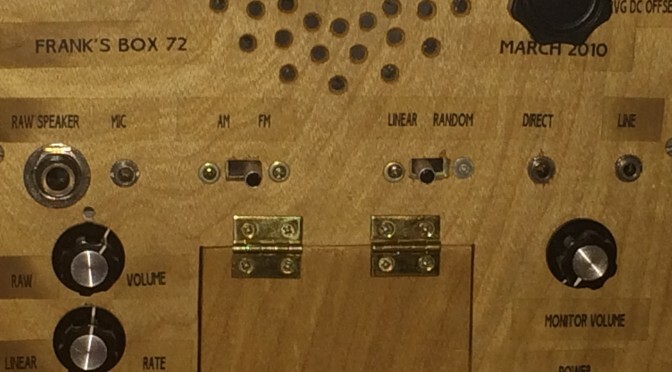 Frank’s Box is a ghost box that produces random voltage to create raw, random or linear sweeping audio from an AM or FM tuner that is then amplified and sometimes fed into an echo chamber before being recorded. Ghost boxes, such as Frank’s box, create audio bits and white noise that ghosts and/or spirits can then use to bring forth words – real time two-way communication. Frank Sumption was the original inventor of the ghost box. He conceived of the idea by first experimenting with Stefan Bion’s EVPMaker software for EVP recording while also being inspired by an October 1995 Popular Electronics magazine article that asked, “Are the dead trying to communicate with us through electronic means? Try these experiments and see for yourself.” Today, Frank is still experimenting with various improvements to his ghost box design. On a personal note, thank you Mr. Sumption for all the years of hard work. The tools we use that were originally created by you are greatly appreciated. If at some time you wish to send us a message we would welcome the talk. Frank, may you rest in peace. In fiction and folklore, a doppelgänger or doppelganger (/ˈdɒpəlˌɡæŋər/; German: [ˈdɔpəlˌɡɛŋɐ] ( ), look-alike, literally a “double goer”) is a double of a living person and sometimes portrayed as a harbinger of bad luck. 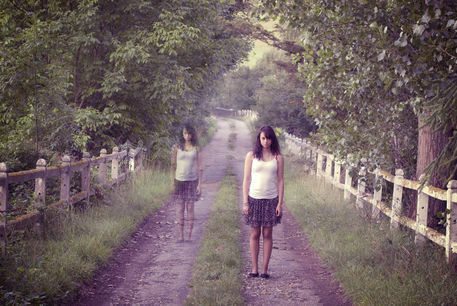 In some traditions, a doppelgänger seen by a person’s relative or friend portends illness or danger while seeing one’s own doppelgänger is said to be an omen of death. In contemporary vernacular, the word doppelgänger is often used in a more general sense to identify any person that physically or perhaps even behaviorally resembles another person. Have you ever heard of a doppelganger? I have but, I am not very familiar with this term well or had any experience with this oddity. Someone stopped in at the library and wanted to tell me a story. Turns out their story was about this very thing. They were traveling on vacation just a month ago. The family stopped for gas. The daughter noticed someone watching her and was very surprised to see the person was her neighbor from home. He waved and smiled, so she waved and smiled. As the father returned to the car the daughter mentioned to him that she had seen the neighbor. He looked around and didn’t see him. They thought it odd that the neighbor was in Montana in the same area they were. He hadn’t said anything about a trip. The father and daughter decided they would ask him how his trip was when they got home and they continued on. Two weeks later they returned home. When the chance arose, the father mentioned to the neighbor what a great trip they had had. He asked the neighbor how his trip was. Stunned, the neighbor asked how did you know I went on a trip. So the father told him what the daughter said. With a puzzled look the neighbor explained that he had been on a trip, but it was to Colorado because his mother had suddenly taken ill. They called the daughter out and she described what clothes he had on and the hat he wore. At first the father thought she might have just seen someone that looked like him, but……. the neighbor then started explaining that he had just bought the same clothes in Colorado and the daughter could not have known he had them. Nothing made sense. The daughter was adamant that she saw him and he had waved and smiled just like the neighbor so knew so well. This event left them all scratching their heads. A short time later the father was retelling the story to someone at work. This person had heard of doppelgangers and asked if he thought this was the case. He just wasn’t sure so he came to me for help. Unfortunately we will probably never know for sure. There are things in this world that keep us wondering. This is just one of the many mysteries of life. Do we just chalk this up to mistaken identity? Or do we keep watch to see if it happens again? I can tell you if it were me, I would be watching. To see someone you know, they smile and wave and acknowledge your presents, I just don’t know. Have you ever had anything like this happen? This is a new one for me. I would love to hear if you have.